Naturally Sculptured Fountains by Leigh Morgan. Fountains, beautifully carved by the forces of nature and sculptor Leigh Morgan - 1999 Winner of the Sydney Royal Easter Show Figurative Sculpture Prize. Leigh Morgan was trained by Melbourne artists Amby Dyson, Vic O'Conner and Noel Counihan - all friends of his late father Frank W Morgan, an established artist and recognised member of the George Bell School. Leigh lives on a beautiful 45 hectacre bush block in Thora near Bellingen on the North Coast of NSW. Leigh, who was previously known for his portraits, abstracts and landscapes, switched to sculpting after a summer school with sculptor Bert Fugleman in 1985. Leigh's has used both drift-wood and the water-eroded roots, branches and butts of the Australian River Oak and Eucalypt trees he has scavenged locally. 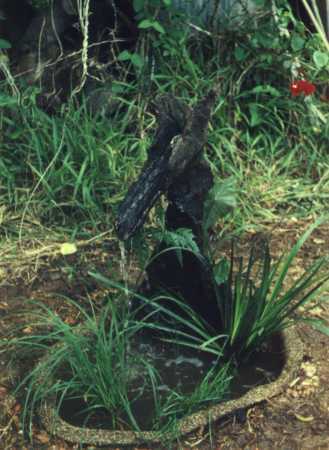 The drift wood is generally from near the mouth of the river and is gathered after a flood. The rest is found in the rivers and creeks of the Bellinger valley - usually at low flow times. The fountain bases are made from fibreglass and are included in the price as is the pump. Leigh is fundamentally a sculpture (Click on the 'sculpture' link above right) who loves working with Cedar and that many of his works should evoke the feminine form follows from his empathy with his medium. "Cedar has the best of the attributes I admire in women, It is truly beautiful,full of life and potential, soft and responsive yet strong and enduring". Leigh works 5 to 8 hours every day and produces 4 or 5 major works and 10 to 12 smaller pieces a year. Above: "Sea Horse" 2000 River Oak root (Recovered from the Bellinger River) $500 complete with pond, native water plants and pump. Left: "Mantis" 2000 River Oak root (Recovered from the Bellinger River) $900 complete with pond, native water plants and pump. 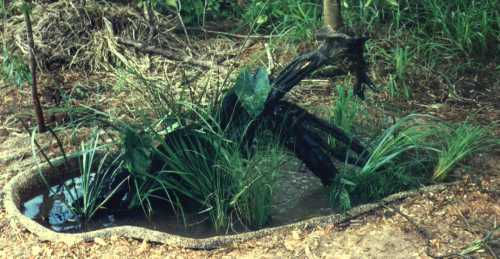 Below: "Goannas" 2000 River Oak root (Recovered from the Bellinger River) $1,900 complete with pond, native water plants and pump. Leigh Morgan's sculptures and paintings are represented in collections in NSW, Victoria, Tasmania, England, USA, Russia and Japan. 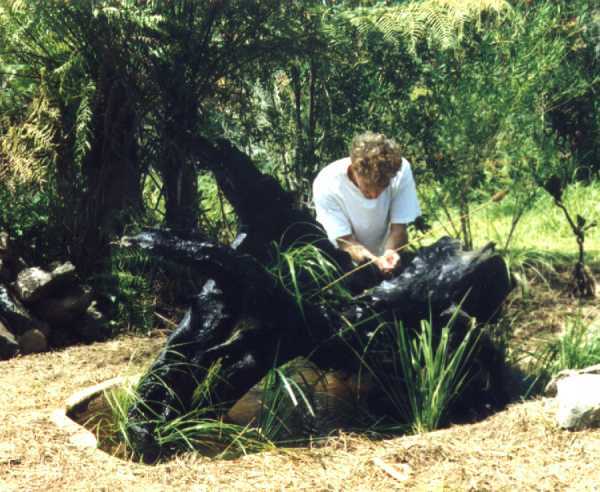 His sculptures are currently on exhibition at the Gannon and the Bischof galleries in Sydney.